On Wednesday 10th September, Barack Obama made a major foreign policy speech, in which he set out how the U.S. and anyone who cares to tag along plan to ‘degrade, and ultimately destroy, ISIL through a comprehensive and sustained counter-terrorism strategy’. As was widely expected, Obama announced that as part of this ‘strategy’, the U.S. will not ‘hesitate to take action against ISIL in Syria, as well as Iraq’. And by ‘action’ he means, of course, bombing. But I just want to take a quick look at how ‘successful’ that strategy has actually been. According to data collated by the New America Foundation, the first U.S. airstrike in Yemen was carried out in 2002. However, there were no further strikes in 2003, 2004, 2005, 2006, 2007 and 2008. It is fair to say, then, that the air war over Yemen properly started in 2009, which was of course Obama’s first full year in office. Given that Obama has pointed to Yemen as an example of how air strikes and drone strikes can work to successfully combat ‘terrorism’, you might reasonably expect to see the number of terror attacks being carried out in Yemen steadily decreasing, year on year, between 2009 and 2014. Well, that’s not quite what’s happened. 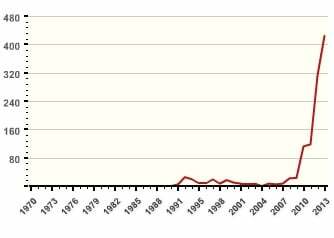 As you can see, from 2009 onwards – the year in which Obama escalated air strikes and drone strikes in Yemen – there has actually been a major increase in the number of ‘terrorist’ attacks being carried out within Yemen. And while correlation doesn’t necessarily imply causation, it simply is not tenable to say the ‘strategy’ being pursued by Obama in Yemen has been ‘successful’. If anything, it seems to have been hugely counter-productive. The air strikes and drone strikes themselves have also, of course, taken a grim toll on Yemeni civilians, and might justifiably be regarded as ‘terrorism’ in their own right. 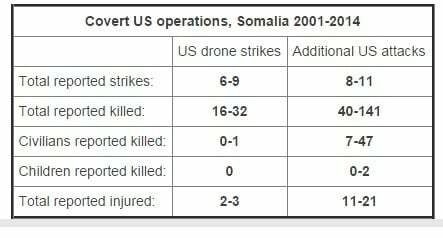 According to data collated by the Bureau of Investigative Journalism, there were 14-20 drone or air strikes carried out by the U.S. in Somalia between 2001-2014. 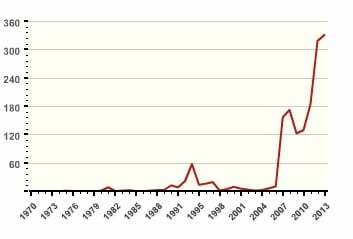 Given that Obama has also pointed to Somalia as an example of how air strikes and drone strikes can work to successfully combat ‘terrorism’, you might reasonably expect to see the number of terror attacks being carried out steadily decreasing, year on year, between 2001 and 2014. But once again, that’s not quite what’s happened. So as in Yemen, there has also been a massive increase in the number of ‘terrorist’ attacks being carried out inside Somalia since the onset of the U.S. air strikes and drone strikes. It’s another country in which you would be hard pressed to say that the ‘strategy’ being pursued by the U.S. is anything like ‘successful’. Obama compares what he will do in Syria to what he did in Somalia, Yemen. That’s reasonable. Problem is neither is much of a success. I might not have used Yemen and Somalia as bright shining examples of US counter-terrorism strategy. Obama promises to use in Iraq and Syria a strategy “that we have successfully pursued in Yemen and Somalia for years.” Successfully? A major increase in the number of ‘terrorist’ attacks being carried out within Iraq and Syria, with all that entails for the people of those countries. Civilians being killed, injured, displaced and immiserated directly by U.S. drone and air strikes. I mean, it’s almost as if the bombing of Yemen, Somalia, Iraq and Syria has nothing to dowith combating ‘terrorism’ at all, and that this is just the pretext being used to drum up support among the American and wider global publics for the same old grubby resource Imperialism. Almost.